Editors note 1: This whole post is one giant spoiler alert related to Season 1 of Game of Thrones. Read no further if you intend to and have yet to watch. This has been a heavy news cycle for climate change. The President addressed it head on in the State of the Union; there were a number of (slightly befuddling) votes in the Senate about the existence/drivers of climate change;the seemingly interminable battle over Keystone XL is reaching its climax; and it was recently announced that 2014 was the hottest year on record. The latter disproves the so-called ‘Great Pause,’ a common (though specious) argument made by climate change deniers/skeptics. Strikingly, the discourse surrounding 2014-as-a-record seemed, at times, to toe the line of celebratory. As if this was the last data point needed to assuage climate deniers’ concerns and move all of us towards collectively addressing climate change. Which, naturally, brings me to the subject of this post, season 1 of Game of Thrones. After intense negotiation, my girlfriend and I recently agreed to commit to watch Game of Thrones. It’s well-liked, multiple seasons are available, and I have my friend’s HBO GO password (check, check, and check!). We both liked it… But one event, one predictable, inevitable event, really sullied it for me: the beheading of Ned Stark. My severe chaffing over his death was equally comprised of an attachment to the only honorable man in Kings Landing, and an unshakable sense of symmetry between Ned and the modern-day environmental movement. I am not lionizing Ned nor the sector of which I am a part – but at their core both are well-intentioned, principled, and let’s face it, naïve. 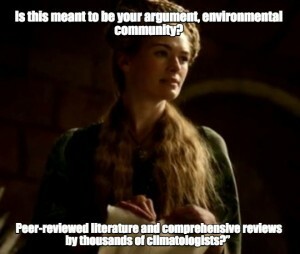 There is no better metaphor for the climate change discourse in the US than Cersei’s response to Ned after he hands her the note from King Robert Baratheon, which makes Ned Protector of the Realm, and thereby removes Joffrey from power. Coldly, Cersei tears it up and asks, “Is this meant to be your shield Lord Stark, a piece of paper?” Or, to put it in terms of climate change, “Is this meant to be your argument, environmental community? Peer-reviewed literature and comprehensive reviews by thousands of climatologists?” Did we, and do we still, think data will overcome ideology? Basically, we just offered our Cersei yet another piece of paper, and they responded, as we should have expected, by voting in force that climate change is not anthropogenic (but that it does exist). Indeed, the IPCC’s fifth assessment may still be scattered about the Senate floor. As a slight aside, kudos to Senator Lindsey Graham of HURDL’s home state of South Carolina for being one of the few Republicans who didn’t toe the party line and instead voted consciously. The Great Pause is at best a fallacious argument – motivated reasoning at its worst and most deceptive. Proving that the Great Pause is over is no more a reason to celebrate than being stuck in traffic, late for a flight, because your friend didn’t take your advice about the [insert many expletives] Brooklyn Queens Expressway. 2014’s dubious honor of being the hottest year ever is no reason to celebrate; it is reason be pessimistic. It means, as I stated before, that the conservation community has all the evidence we need to sway the entirety of public opinion on anthropogenic climate change. Yet we haven’t. And if we think that this data will change the hearts and minds of climate deniers, we ought to save our breath for the heavy blade of Joffrey’s henchman. We must acknowledge the fact that the logic and processes we hold so dear don’t matter when we’re interrupting someone’s narrative. We were – we are – Ned Stark. The death and destruction left in the wake of the earthquake that struck Haiti on January 12, 2010 was extraordinary. More than 200,000 people died and the financial damage exceeded 120% of Haiti’s 2009 GDP. After the immediate search-and-rescue activities, humanitarian agencies, alongside the Haitian people and government, turned their attention not merely to getting life back to normal, but to the goal of ‘building back better.’ Billions of dollars and extraordinary human capital poured into Haiti, yet during the recovery process a vital factor to ‘building back better’ was often overlooked: environmental sustainability (ES). Environmental concerns simply do not drive decision-making. Pre-positioning and pre-planning are logistically difficult. These barriers are reinforcing and deeply interrelated. For example, in Haiti, if it were perceived that ES required trade-offs in speed or costs – a common but ultimately disproven perception – ES would generally not be pursued. Moreover, in the balancing act between rapid response and comprehensive planning, an emphasis on speed tends to persist past the search-and-rescue phase and into the mid- and long-term recovery. The emphasis on speed is driven by the unique pressures of operating in a post-disaster setting (e.g., media and donor scrutiny). Even if humanitarian actors wanted to pursue ES, structural, organizational, and logistical barriers impeded implementation. In addition to a lack of clarity regarding who was ultimately responsible for taking the lead on environmental programming, the fact remains that there were limited actors with sufficient expertise in both the environment and disaster recovery to lead the effort. That is, even if ES was considered a paramount concern, there were significant human capital challenges that would have impeded their efforts. As a result of the totality of these barriers, in Haiti, ES ultimately came down to the capacity and motivation of specific implementing agencies, many of which were already overwhelmed with the complex operations one would expect after such an extreme event. While asking the humanitarian sector to consider the environment might strike some as beyond the humanitarian imperative – to save lives and reduce suffering – this ignores three critical points: 1) with the right expertise and proper planning, considering the environment will not interrupt the mid- and long-term humanitarian response; 2) proper environmental management will help bridge the gap from emergency response to long-term redevelopment; and 3) in the mid- and long-term recovery, ignoring the environment can expose new vulnerabilities or exacerbate old ones. As such, ES must be embraced as a goal – or more accurately, a tool – of the humanitarian sector. Conversely, disaster response efforts that do not incorporate ES risk hindering long-term recovery efforts, and thus, disaster resilience. Author’s Note – Two points of clarification: First, the environment in this instance refers to local, acute issues – particularly those around the impact site (e.g., increased risk of landslides due to improper material extraction). This is not about global environmental issues (e.g., climate change). Second, this analysis focuses on the mid- to long-term recovery and not search-and-rescue or emergency operations. To paraphrase a research participant, I am not suggesting ‘we hug a tree before we hug a baby.’ I operationalized a definition for post-disaster sustainability as “Sustainable post-disaster activities provide resources to affected citizens to ensure health and safety and to promote redevelopment, without causing further damage to land or existing structures, exacerbating the impacts of the disaster, or placing undue stress on the natural environment. Every once in a while I am asked a very troubling question: “Do you believe in climate change?” The phrasing “do you believe in” or any variation thereof feels like ice water being injected my spine. It demonstrates that the conservation community has all but botched the trial on climate change. If this were a criminal case, we provided means, motive, and intent, but couldn’t counter the defense’s wordplay, trickery, and jargon-laden half-truths. Manifestations of this loss keep coming up. A few weeks ago I visited some old friends. Over a cocktail (or two), climate change worked its way into the conversation. Though not climate deniers per se, they fall somewhere in the skeptical-to-unconcerned range on the alarmist-to-denier continuum. And they are skeptical because, like most Americans, they don’t have time to fact-check the barrage of climate-related information they hear from myriad sources, including some that suggest climate change is not affected by human activity. These hard-to-check impressive sounding “facts” are the simultaneous danger and strength of climate denier’s misinformation campaign; they somehow transform scientific evidence into a viewpoint in a political debate. For those interested in forestalling serious climate legislation, a politicized hung jury in an increasingly partisan society is exactly what a win looks like. But, moral high ground or not, this is as much on those of us who see climate change as a major challenge as it is on those who argue against action or its existence. Worse, the combined politicization and evident reality of climate change is a double-edged sword. Those who deny climate change have perverse disincentives to back away from their intransigence. They are in a corner: continue to deny humanity’s most pressing challenge or walk away from the denial discourse and face serious political ramifications in terms of their own legitimacy. It’s a nasty paradox. The scientific community and its political allies have, contrary to Sun Tzu’s advice, left our “enemy” no way of escape. Trapping our “enemies” in a particular corner of the climate change debate, and allowing the resultant discourse to be viewed as a left-right issue, has presented us with a deadlock that inhibits further progress. Maybe its time we stop fighting dogma with logic and politics with science. These are flawed strategies; it is asymmetrical warfare. Converting climate deniers is not an issue of showing them the science – we have done that. It has failed. It continues to fail. What we must do is find a graceful way out for the climate skeptics that we – I, for sure – have so long vilified. This is not to suggest we should let up on correcting the widespread dissemination of misinformation (John Oliver’s piece on this is perfect, if you haven’t watched it, do it now.). Only that accidental or intentional vilification offers little to the cause. Our focus need be dispassionate advancement of meaningful climate change policy. We need to change the conversation and demonstrate the big Truth of climate change legislation: that it appeals to conservative ideals, even if not certain right-leaning constituents. This needs to be made more explicit. The Republican Party prides itself as responsible, long-term planners (see the budget discourse), yet are unconcerned about the widespread economic effects of climate change? Or the myriad impacts on impacts on national security outlined here? It just doesn’t add up. My blog entry/chapter for Andy Sumner‘s forthcoming e-book The Donors’ Dilemma: Emergence, Convergence and the Future of Aid is up at the Global Policy site here. Have a look, offer comments, and join the larger conversation Andy is curating on the future of aid here. For more thoughts on food security, especially the connections between climate change and food security, check out my posts at Open the Echo Chamber. The majority of my time is spent thinking, reading, or writing about environmental issues – usually as they relate to disasters and conflict. The problems are daunting and the solutions are evasive. The nailing-Jell-O-to-the-wall cliché comes to mind. This post introduces what I believe to be one of the most salient and complex challenges facing the conservation sector: ‘the back burner effect.’ In essence, most environmental problems are inherently long-term, but people think and act in the short-term; as a result conservation efforts get perpetually pushed to the back burner (if even on the stove). The paradox, though, is that ignoring the global environment often comes at the long-term peril of the very issues we prioritize in the short-term. The question, then, is how can the conservation community gain traction on the inherently long-term despite the intractable, inevitable, and legitimate issues that exist – and will always exist – in the short-term? Spoiler alert: I’m not sure, it’ll be messy, and we’re trying. The above points are why so many environmental organizations have galvanized around Keystone XL. The pipeline is a physical manifestation – something to point to and rally behind (this has been discussed here and here amongst other places). However, even if President Obama rejects the pipeline (a decision I fully support), then what? At best, we ducked Mother Nature’s right cross, but her left hook is still coming (or, depending on who you ask, a glancing jab). As are the flurry of body shots. And last I checked, the 7 billion of us are propped up against the ropes with our hands down – hence the importance of climate adaptation and resiliency efforts. But what has been lost in the discourse surrounding all things Keystone is that with or without it, we will continue to spew carbon-based gasses into the atmosphere – all in the name of front burner priorities. That is not to discount the work surrounding the pipeline, or the bravery of those who engaged in civil disobedience this weekend, just to outwardly acknowledge that what we need to change does not lend itself to focused protests. Moreover a ‘win’ in Keystone is almost like a carbon-based slight of hand – misdirection from the unrelenting yet hard-to-define social, economic, and political factors that steadily drive environmental degradation as well as the associated policy interventions that sit stubbornly on the back burner. There’s still hope. No, really there is. But the question remains: Without clear focusing events (e.g., the Cuyahoga River Fire), and with so many other ostensibly-more-pressing issues, how can the environmental sector grab people’s and governments’ attention for long enough to advance their/our [critical to humanity’s existence] agenda? It’s a dicey and frightening quandary representative of challenges of the back burner effect and one, I’d argue, that needs far more outward reflection by the conservation sector.